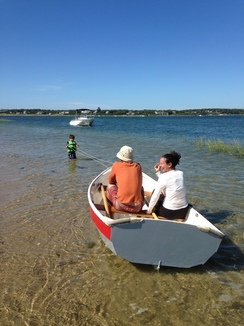 Elizabeth, Norm, Zachary, Tabitha, Alicia, Stos, Marina and Zephyros aboard Averisera and our nutshell pram, Giddy. Stage Harbor. Our first foray into buying rock was an adventure of sorts. We saw a pallet of rocks outside a hardscaper's shop. It was marked, for sale. We bought it all, six trips in the Mazda B2300, about a ton and a half. Tom came over and made the side steps. Very nice. Round Two: saw another opportunity to get some leftover rock and drove in to see if we could score another ton or so. Yup! 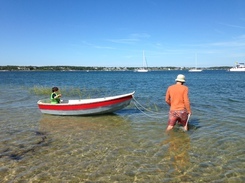 Nice price and the seller is a sailor, chatted with Elizabeth about boats. She was wearing some sailing regatta gear. 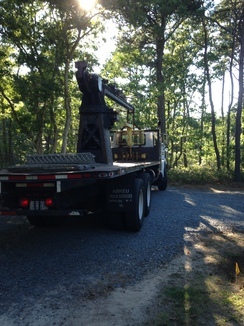 For short money, we got another ton or so delivered. We will make a new path, extending an existing path. 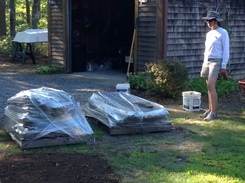 Round Three: ordering two tons of crushed rock for some trim around the house and the leftover for the driveway. 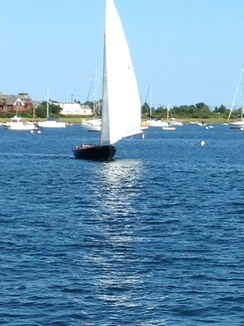 Averisera is in Stage Harbor, Chatham, MA. Harbor has a mix of small commercial fishing vessels and small recreational vessels that are mostly power boats. 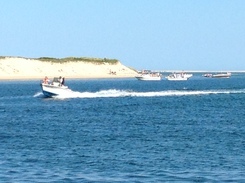 Sunday, the small boats, well families on small boats, converge on the shore line at the harbor entrance. the beach has a few names, Luau Beach, Crescent Beach, South Beach and maybe a few others. 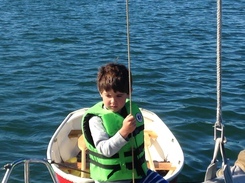 There is only one practical way to gain access, by boat. 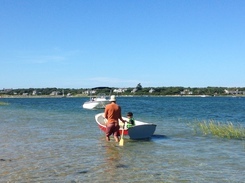 Last Sunday, August 24, was a perfect beach day and the place never looked happier. 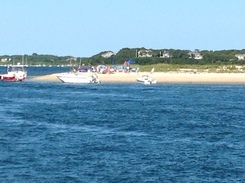 Looking along the South side of the Beach towards Monomoy Island and the South Cut. 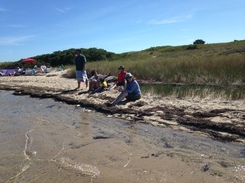 The Atlantic is a couple miles away on the other side of the barrier beach, Monomoy Point. Looking into the Harbor with Morris Island (or as it is becoming known, Stage Island) homes on the bluff. The inner harbor is in the far distance. 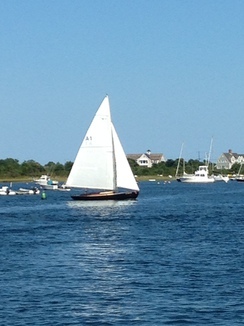 The Herreshoff Alerion, Mooncusser, belongs to a fellow who was at Camp Viking at the same time I was a counselor at Viking during the late 1960s. We said "Hello" as Averisera and Mooncusser crossed tracks. 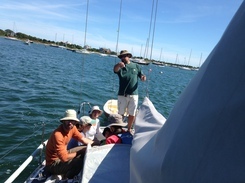 No pictures of the event but Elizabeth, Zachary, Tabitha, and I got out for a sail Sunday. 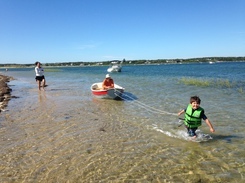 We went down towards the tip of Monomoy. The wind was a gentle breeze from the NE and the sea state, flat! 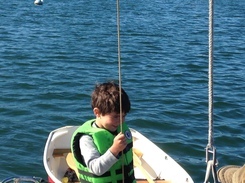 A perfect Sunday family sail. Next week, grandchildren. 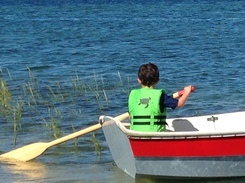 We are plotting to introduce them to a small rowing dinghy we just purchased for such occasions.